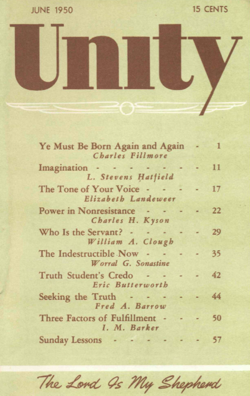 Here is the June 1950 issue of Unity magazine. I BELIEVE in God, the good, the one presence and power in my life and in all the universe. I BELIEVE in Christ, the Son of God, in whom is imaged the ideal creation, and who resides in me, in the secret place of my soul. I BELIEVE in the omniscience of God in Divine Mind, and that through my mind I may become the outlet of all there is in God. 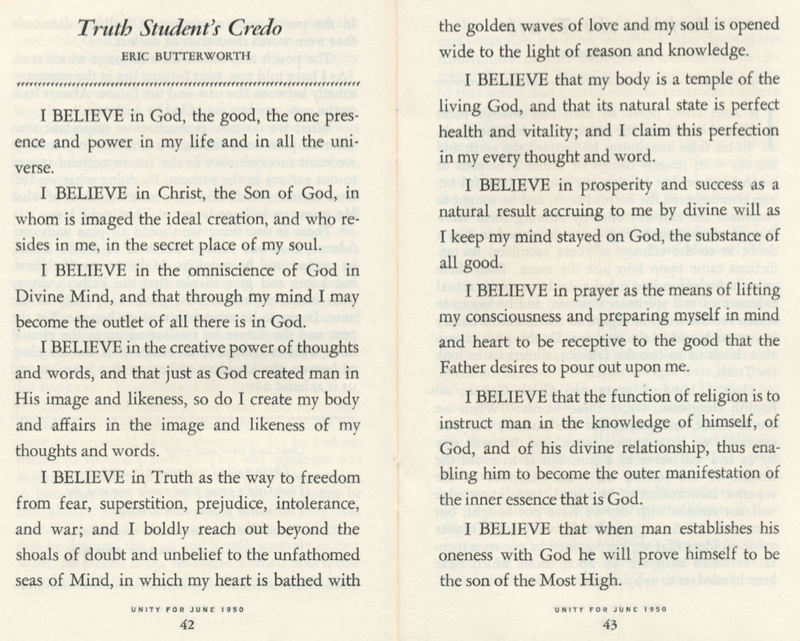 I BELIEVE in the creative power of thoughts and words, and that just as God created man in His image and likeness, so do I create my body and affairs in the image and likeness of my thoughts and words. I BELIEVE in Truth as the way to freedom from fear, superstition, prejudice, intolerance, and war; and I boldly reach out beyond the shoals of doubt and unbelief to the unfathomed seas of Mind, in which my heart is bathed with the golden waves of love and my soul is opened wide to the light of reason and knowledge. I BELIEVE that my body is a temple of the living God, and that its natural state is perfect health and vitality; and I claim this perfection in my every thought and word. I BELIEVE in prosperity and success as a natural result accruing to me by divine will as I keep my mind stayed on God, the substance of all good. I BELIEVE in prayer as the means of lifting my consciousness and preparing myself in mind and heart to be receptive to the good that the Father desires to pour out upon me. 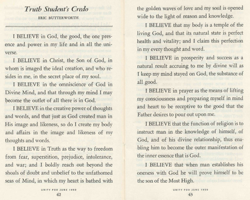 I BELIEVE that the function of religion is to instruct man in the knowledge of himself, of God, and of his divine relationship, thus enabling him to become the outer manifestation of the inner essence that is God. I BELIEVE that when man establishes his oneness with God he will prove himself to be the son of the Most High. I cannot seem to download but I otherwise love love Unity and all the resources you allow people to listen to and read and pray with. You are wonderful!